The series RSW circuit (top) previously used at Chief Industries employed one transformer to provide power to form four weld nuggets. 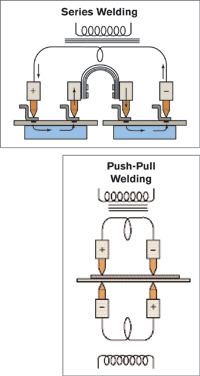 Push-pull welding (bottom) now in use at Chief features opposing electrodes—four per transformer—to generate two spot welds simultaneously. can cause excessive material shrinkage at the weld nugget. When weld appearance counts, as it often does, this means operators have to go back and fill in the craters created due to shrinkage. After the Bondo comes grinding and sanding to smooth the area. End result: extra hours of wasted labor that fail to add value and instead just shrink the bottom line. Something better came late in 2008 with the arrival of a new custom-designed and built RSW machine from T.J. Snow Co., Chattanooga, TN. Among its design enhancements is the use of push-pull circuitry rather than the series-style circuit previously employed, as well as automation features to improve throughput by as much as 20 percent. Wall panels and doors comprise 12-gauge galvanneal panels 2 to 4 ft. wide. The machine joins a series of rolled hat-section stiffeners, of 16-gauge cold-rolled steel, to the panels in several rows spaced 6 to 12 in. apart. Resistance welds are placed every 3 in. along the stiffener flanges. The new machine mounts 16 pneumatically operated weld cylinders and weld guns to a machined dovetail slide to the upper crown; guns can be independently positioned along the length of the crown to accommodate custom weld patterns. Lower tooling comprises 16 high-pressure platen-mounted electrode holders. A toggle table lowers the tooling to allow indexing of the panel assemblies, between weld sequences, to avoid dragging the material across the top of the electrodes. “That’s just one advantage we gain from the new machine,” says Peters, noting that premature electrode wear from the previous machine led to excessive weld-tip dressing, and caused unplanned downtime. Now, once a set of 16 welds has been completed and the toggle table drops to move the electrodes a from the material, the assembly shifts by of two gauge bars, one on each side of the machine. Since order size for each door can be as little as one or two, setups change frequently and automating the gauge-bar setup was a key machine specification, adds Peters, allowing speed and throughput to climb. To manufacture wall panels—which the firm hopes to move into in a big by virtue of the improved productivity and quality it’s enjoying with the new machine—typical order size is 12 panels/cell. To run the machine, an operator loads a pre-tacked panel onto the machine and positions it against the left-hand gauge-bar assembly and underneath a series of laser-dot indicators. These indicators help the operator align the material to ensure proper weld placement along the stiffener flanges. 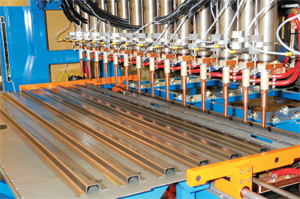 To fabricate a prison-door panel (shown), Chief Industries’ new automated resistance-welding machines features 16 opposing sets of welding guns to spot-weld mild-steel top-hat-shaped stiffeners to a galvanneal sheet. Bottom electrodes mount on a toggle table that lifts the electrodes into welding position as the top electrodes index downward. With a weld cycle completed, the toggle table retracts to allow the panel to automatically index to the next weld position without dragging over the bottom electrodes. then extend downward and the first series of 16 welds are completed. The guns retract, the toggle table drops, the gauge bars shift the panel and the sequence repeats. The setup uses 1.25-in.-dia. zirconium-copper electrodes (preferred for welding galvanneal and other coated materials, to avoid electrode sticking)—Tuffaloy TA-25CZ male caps on top and a flat-face lower electrode. Reduced weld heat and power, combined with the ability of the toggle table to prevent electrode marring during indexing of the assembly, have improved electrode life between dressings by 20 percent, says Peters. Along with its automation capabilities, the machine’s push-pull circuitry is a big hit at Chief Industries. T. J. Snow engineers designed each of the machine’s eight push-pull circuits, which run along the width of the machine, to include four weld guns and two transformers. The machine’s upper crown and its lower knee each hold a bank of eight transformers to power the circuits. This differs considerably from the previous machine’s series-welding circuitry, which used only four huge transformers mounted to the upper crown, Each transformer had to generate enough power to complete a set of four welds per cycle. “We really had to crank up the power to pull the nuggets and form the spot welds,” says Peters. “This created quite a divot at each weld location. Now, the push-pull setup provides better weld control and nicer-looking nuggets, with much less heat input, so the resulting divots are barely visible.